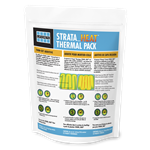 Laticrete Strata Heat Thermal Pack is a patent pending additive designed exclusively for use in select Laticrete adhesives for uniform heat distribution in the Strata Heat Floor Heating System. Laticrete Strata Heat Spacing Strips are plastic tracks that are attached to the substrate for installing the Strata Heat Wire. Laticrete Floor Heat Mat is a versatile floor warming mat designed to be installed underneath tile and stone floors to provide luxury and comfort. The product includes adhesive backing for easy installation. Laticrete Strata Heat Mat combines the comfort of floor heating wire with the advantages associated with Strata Mat uncoupling membrane. Strata Heat 120/220V thermostats have a digital, programmable display that can be controlled through Wifi. Laticrete Strata_Heat Mat - 150 sq ft.